We post useful information so that it will be helpfull for you to know new things. The past glory of the Malla rulers continue to be reflected at the Durbar Square. Pottery and weaving are its traditional industries. The city lies about 14 km east of Kathmandu. 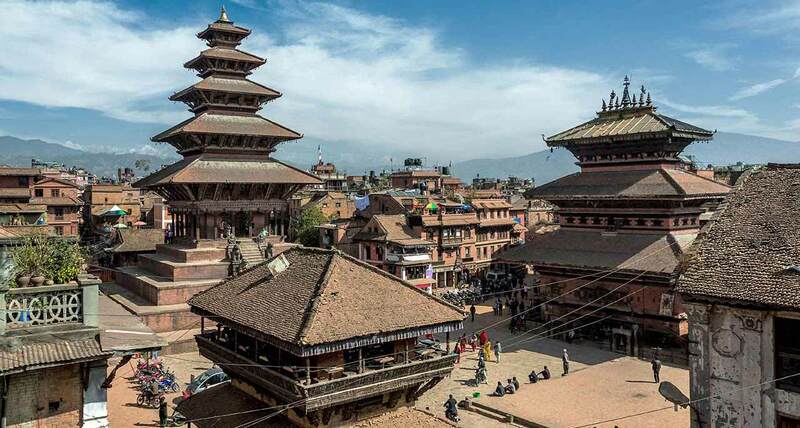 Bhaktapur drapes across an east-west fold in the valley, its southern fringe sliding down towards the sluggish Hanumante River. Owing to a long-term westward drift, the city has two centres (residents of the two halves stage a boisterous tug- of-war during the city’s annual Bisket festival} and three main squares. In the west, Durbar Square and Taumadhi Tol dominate the post-fifteenth-century city, while Tachapal Tol presides over the older east end. You’ll arrive by one of two routes. Our Private car/coach or local buses that leaves from Old Bus park Kathmandu every 10 minutes drops you on the main road about ten minutes’ walk south of town. Arriving by minibus from the City Bus Park, you’11 be deposited near Sidha Pokhri, a five-minute walk west of Durbar Square. Local buses from Nagarkot terminate at Kamal Binayak, five minutes northeast of Tachapal; tourist buses from Nagarkot continue to the main intersection just north of Durbar Square. Bhaktapur has no rikshaws and just a few resident taxis, but it’s compact enough to be explored on foot One-speed bikes can be rented along the road east of minibus park (west of Durbar Square). Nepal may be overlooked as a leader of technology in the 21st century. But its history shows the nation was ahead of its time when it came to architecture. Nyatapola, a five-story pagoda temple built in 1702, still stands today even after surviving a 8.3 earthquake in 1933. 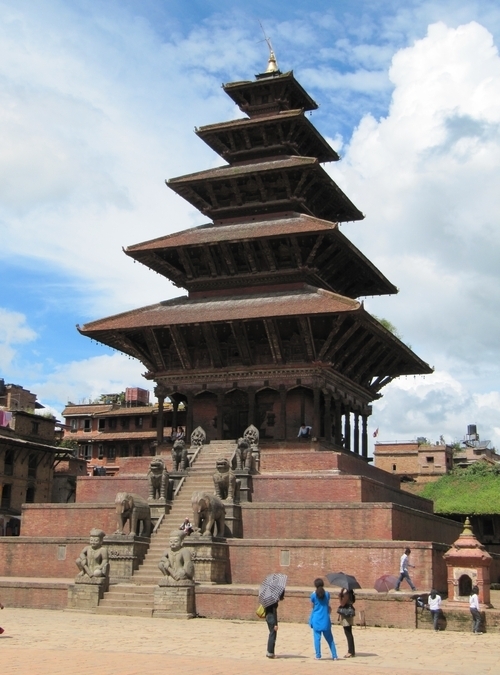 The Nyatapola temple is the largest temple of Bhaktapur. It rests on a base on five levels with four sanctuaries of Ganesh in the four corners. Standing at 30 meters high, it dominates the city. 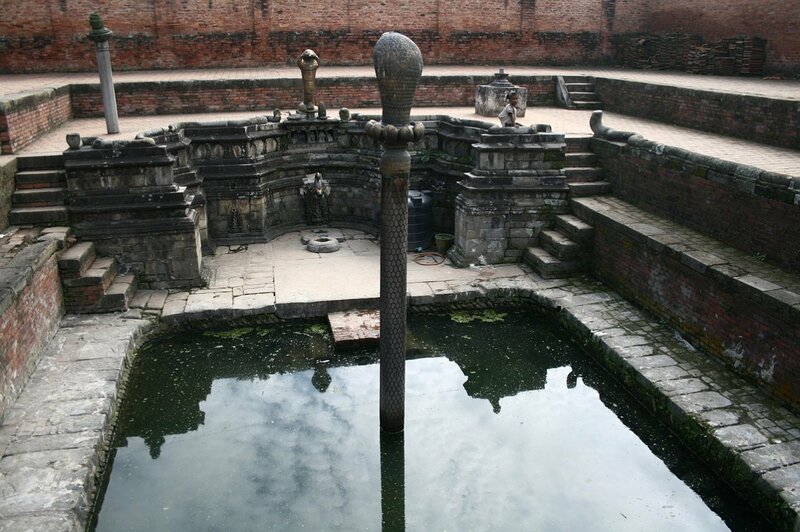 It was built in the period of King Bhupatendra Malla when Bhaktapur was a sovereign state. It was built with wood and bricks and has artistic designs. 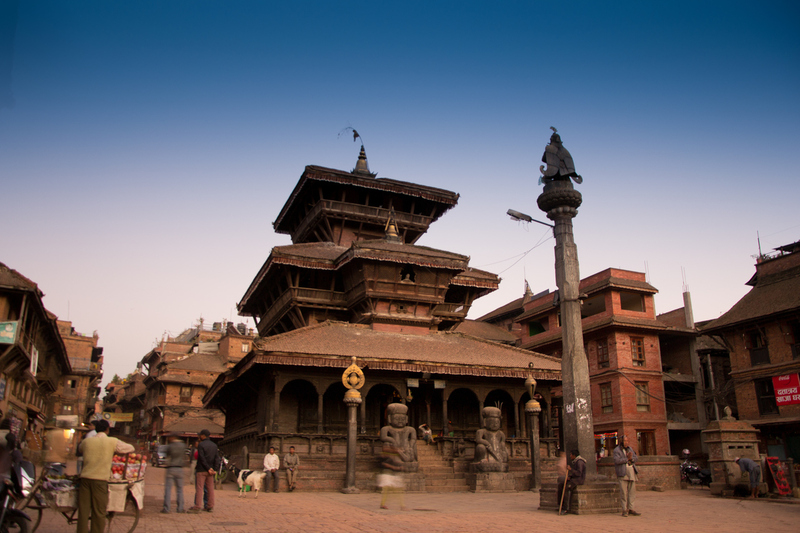 Nyatapola in newari language (a local language of Bhaktapur) means “five-story temple.” The locals believed that this temple was built to quiet Bhairab, an angry god. Bhairab’s temple is in front of Nyatapola. Bhairab’s mandir was built before Nyatapola. The legend says Bhairab vandalized the society of that time. So the people discussed with King Bhupatendra Malla and finally decided to build a more powerful temple than Bhairab’s. To make Nyatapola strong and powerful they made a statue in front of temple of elephants, tigers, a powerful snake god and Bhaktapur’s strongest man Jaya mal Pata. Also, Siddha Laxmi, a powerful and benevolent god, was worshiped inside Nyatapola. After calming Bhairab, peace prevailed in the city and people lived easily and happily. Thousands of tourists come every year to appreciate the technology used to make this temple. In the 18th century, many temples, statues and stupas were built in Nepal, mostly in Kathmandu, Bhaktapur and Lalitpur, which were three different states at that time. 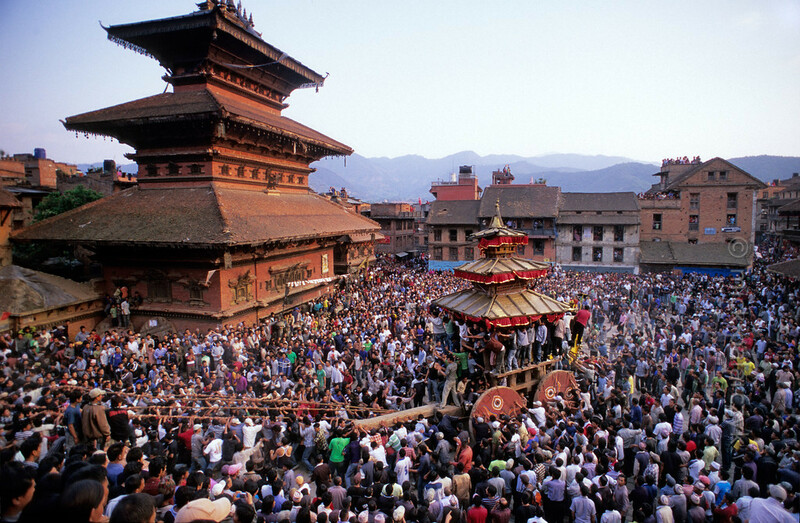 Now these three places are known as the Kathmandu valley, or the valley of temples. Bhaktapur Durbar SquareThe Golden Gate: The Golden Gate is said to be the most beautiful and richly moulded specimen of its kind in the entire world. The door is surmounted by a figure of the goddess Kali and Garuda (the mythical man bird) and attended by two heavenly nymphs. It is also embellished with mythical creatures of marvellous intricacy, In the words of Percy Brown, an eminent English art critic and historian, the Golden Gate is the most lovely piece of art in the whole Kingdom: It is placed like a jewel, flashing innumerable facets in the handsome setting of its surroundings. 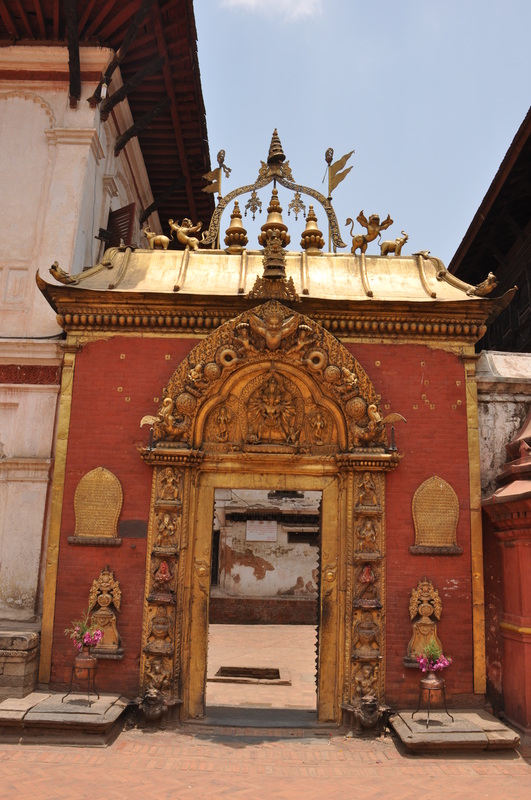 The gate was erected by King Ranjit Malla and is the entrance of the main courtyard of the Palace of Fifty five Windows. The Palace of Fifty five Windows: This magnificent palace was built during the reign of King Yakshya Malla in A.D. 1427 and was subsequently remodelled by King Bhupatindra Malla in the seventeenth century. Among the brick walls with their gracious setting and sculptural design, is a balcony with Fifty five Windows, considered to be a unique masterpiece of woodcarving.